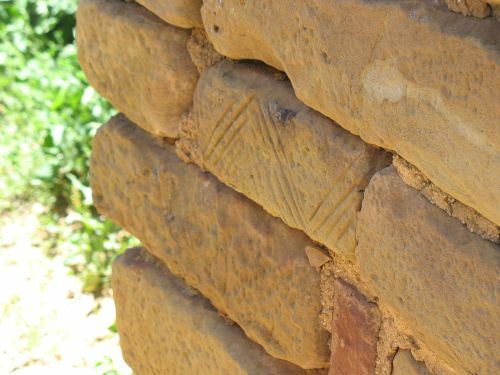 When I visited Mesa Verde this summer, I noticed a rather odd sandstone block at Pipe Shrine House, one of the mesa-top sites known collectively as the Far View Group. 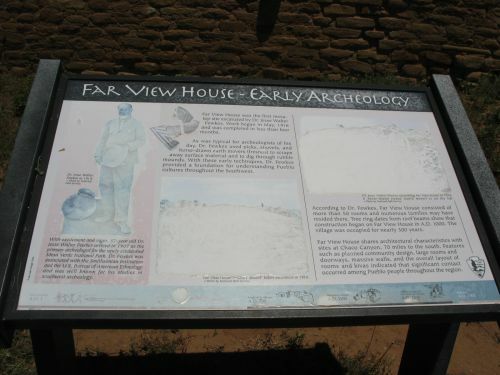 These sites, like many others in the park, were excavated by Jesse Walter Fewkes in the early twentieth century, and documentation of the work done on them is correspondingly sparse. The block in question has a spiral pecked into it. Not a whole spiral, though; rather, the middle of a spiral, with the upper and lower parts missing, as if the block were cut from a cliff face where a spiral petroglyph had been pecked. Indeed, the only really plausible way to explain the block is that it was indeed cut from such a cliff face. This is very odd. I’ve never seen anything quite like it elsewhere. There are a few other sites in the Far View Group that have blocks with designs on them, mostly parallel lines, but those are generally incised and they don’t bear much resemblance to common petroglyph designs. They don’t show any particular evidence of the designs having been present on the stones before they were cut, either. The spiral, though, is a very common type of petroglyph, and the Pipe Shrine block remains very puzzling. Who cut that block? Where? Why? It’s very hard to say. The fact that the block is at the top of the current wall strongly suggests that it was not originally part of the site. In sites like this the top stones are generally modern capping put on with cement to protect the original walls beneath. The spiral block, then, was almost certainly put on in the twentieth century. It may have been put on by Fewkes himself after he excavated the site; recent dendrochronological research at the Sun Temple, which Fewkes also excavated and stabilized, has shown that he did a substantial amount of rebuilding there, and it’s quite plausible that he did the same at Pipe Shrine House. If it wasn’t Fewkes, it was probably some later Park Service stabilization crew. Regardless of who put the stone where it is now, though, the bigger question is where they got it, and how. The mystery is amplified by the fact that Mesa Verde is known for having relatively few petroglyphs compared to many other areas with comparable ancient populations. 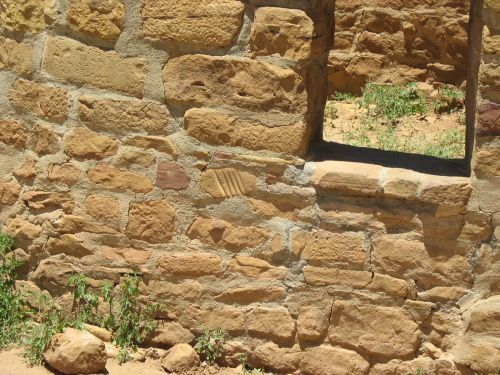 The stone looks like the same Cliff House Sandstone (Mesa Verde Formation) as the other stones in the wall, although its patina seems to be a slightly different color, which may or may not be relevant to its origin. There’s no reason to think it comes from anywhere other than Mesa Verde, but that makes it all the more inexplicable that Fewkes or anyone else would have cut into one of the few petroglyph panels on the mesa for building stone when there are few things in the area more plentiful than sandstone. I’m no expert on Mesa Verde, of course, so it’s quite possible that the story of this stone is well-known or at least published somewhere in the voluminous literature on the archaeology of the area, but if so I haven’t seen any reference to it. It’s just very puzzling, and I don’t have a clue what the answer is. 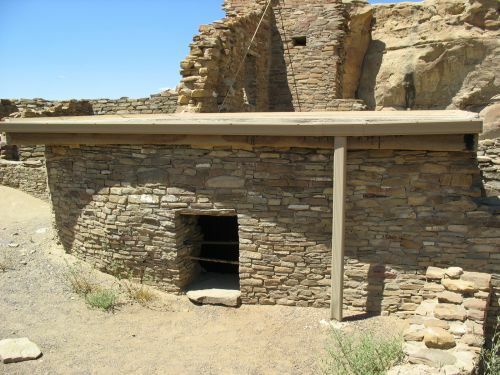 Pueblo Bonito is the best-known of the sites in Chaco Canyon, and the only one the park currently gives regular tours of. It has the reputation of being the largest as well. These days we generally just describe it as the largest great house in the canyon, but in the past there were many more hyperbolic descriptions. 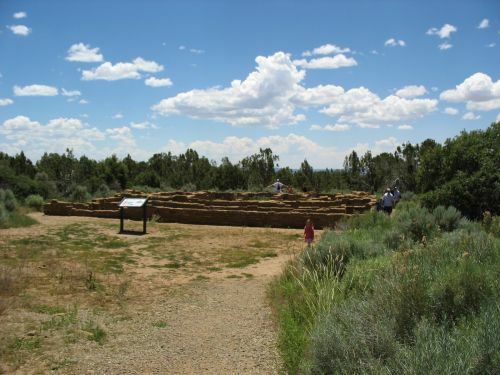 Neil Judd, who excavated about half of it in the 1920s, was particularly known for presenting it as the largest pueblo ever and the biggest building in America until some skyscraper built in New York in the nineteenth century etc. etc. There are several things wrong with Judd’s view of Pueblo Bonito, which I think has contributed significantly to an overly Bonito-centric view of Chaco as a whole. For one thing, as ably demonstrated by Steve Lekson, Pueblo Bonito is by no means the largest “pueblo” (a problematic term itself) ever built; indeed, many of the later aggregated single-roomblock pueblos are much larger than it, and villages composed of multiple buildings, which is to say most “pueblos” throughout prehistoric and historic times, can be much larger again. Indeed, it’s not clear that Pueblo Bonito is the biggest anything anywhere. 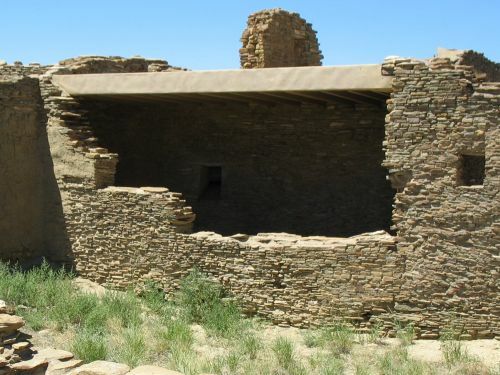 At best, it’s the biggest great house in Chaco Canyon, but when we say that we generally have to qualify it by saying “by mass” or something similar, since Chetro Ketl is actually slightly larger in area. Be that as it may, Pueblo Bonito is certainly big, and it certainly seems to have been important. 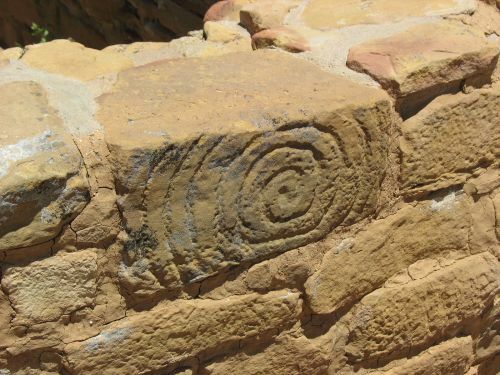 There has been much more research on it than on any other great house inside or outside Chaco Canyon, and as a result we know a lot more about it today than we know about most other sites, another reason it may have an outsized influence on interpretations of Chaco as a whole. Research on Pueblo Bonito has been going on for over one hundred years, and a useful collection of recent thought about it, put together at a conference marking the centennial, is Pueblo Bonito: Center of the Chacoan World, a collection of papers edited by Jill Neitzel of the University of Delaware. While it’s a little uneven, as collections of papers tend to be, it’s a good way for people who want to go beyond the basic introductory works to get a sense of where current thought on Pueblo Bonito is. One of the key debates about Chaco these days concerns the amount and type of hierarchy present in Chacoan society, and much of the evidence on which the debate hinges comes from Pueblo Bonito, so it is only natural that a book like this should take on the hierarchy question as one of its main topics. Neitzel falls very much on the “more hierarchy” side, and while not all of the other contributors quite agree, the structure of the book overall clearly reflects that. This is not too surprising, since the importance of Pueblo Bonito to the hierarchy debate is primarily in its status as the source for much of the evidence interpreted as showing hierarchy, and people who specialize in studying Bonito tend to therefore be more receptive to hierarchy than those who specialize in other aspects of the Chacoan system. In addition to hierarchy, the other two topics on which this book focuses are the function and population of Pueblo Bonito. These are by no means independent of the hierarchy issue, but the evidence used for debates over them is typically different. It may seem surprising that such basic questions as what Pueblo Bonito was for and how many people lived there would still remain open after over a hundred years of intensive research, but that is in fact the case, and interpretations vary considerably. As this book demonstrates, different lines of evidence can lead to quite different conclusions about even such seemingly simple issues as these. Neitzel’s introductory chapter sets out these three themes, along with some basic background about Pueblo Bonito and the history of research on it. The next nine chapters then discuss various aspects of Pueblo Bonito, studied using various methods, and Neitzel returns in the final chapter to sum up and draw conclusions (shockingly enough, she decides that the evidence presented in the book supports a hierarchical interpretation of Chaco). As I said above, the papers that form the middle chapters are a bit uneven. Anne Lawrason Marshall’s Chapter 2 on the siting of Pueblo Bonito is interesting, but pretty short and not very detailed. She notes that while there are some practical aspects of the siting of Bonito, particularly its location on the north side of the canyon where it gets considerable solar radiation, there are also some oddities about it that suggest that symbolic or ceremonial factors were important as well. The most notable of these oddities is the fact that the great house was built right under a huge rock leaning out menacingly over the canyon, which the Park Service called “Threatening Rock” until it finally fell in 1941 and crushed about thirty rooms of Pueblo Bonito. 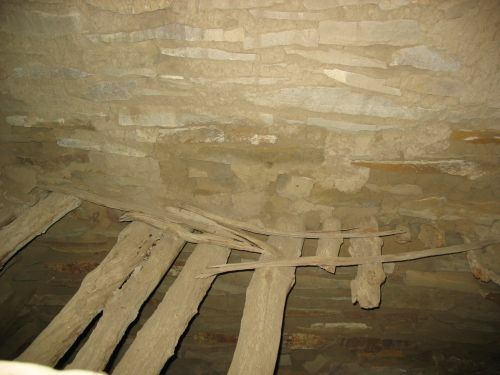 Marshall notes that unusual rock formations are considered sacred at some modern pueblos, which suggests that it may have been precisely because of this impressive, dangerous rock, rather than despite it, that Pueblo Bonito was placed where it was. Seems plausible enough to me. Chapter 3, by Tom Windes, is much more detailed. It’s an account, based largely on very recent tree-ring dating, of the various construction stages of Pueblo Bonito, starting sometime in the mid-800s and continuing at least through 1150 or so. The data presented here is very valuable just as a reference, though it’s clear even from the other chapters in this book that not all archaeologists agree with all of Windes’s interpretations of that evidence. His emphasis is largely on the shifts in apparent use of the building through time, rather than on the possible continuities that have been emphasized by some others. Windes has long been associated with the idea that Chacoan great houses had very few permanent residents, and here he stays true to form by suggesting that “the site’s resident population never exceeded 100 people.” Overall, however, he is more concerned here with the details of Pueblo Bonito’s construction and occupation history, and he doesn’t make a whole lot of sweeping conclusions based on them. Rather different from Windes’s approach, and an interesting juxtaposition to it, is Chapter 4, by John Stein, Dabney Ford, and Rich Friedman. Ford is the head archaeologist at Chaco Culture National Historical Park, while Stein and Friedman have been closely associated for many years with the Navajo Nation’s Chaco Protection Sites project. Here they are mostly concerned with describing and discussing the creation of an extremely detailed and accurate architectural model, both physical and virtual, of Pueblo Bonito. They start with an overview of previous reconstructions, particularly artists’ renditions, and they point out the flaws they see in these interpretations when compared to the archaeological evidence and determine to avoid them in their own efforts. Much of the rest of the article is a serious of images of the final computer models of the various building stages of Pueblo Bonito, with discussion of these stages in the accompanying text. They are clear about where they have made assumptions and what effect those assumptions have on the resulting model, which is important because pictures can have a persuasive force out of proportion to the accuracy of the data underlying them. While their reconstructions are mostly in accord with Windes’s interpretations of the various building stages, there are some differences, and these serve to emphasize the importance of the different assumptions used in making these models. I find this interpretation rather implausible. As the quote indicates, it rests heavily on the idea that the foundations served at least partially as massive blueprints to guide construction. I actually don’t have a problem with this idea, which makes sense to me. Where Stein, Ford, and Friedman lose me, however, is in making the leap from this to the idea that, because the foundations were laid out in advance, they were probably all laid out at once, perhaps by a single man. While there’s no way to definitively prove or disprove something like this, of course, a look at the actual layout of the building suggests to me at least that if one guy designed a building to look like this he must have been a pretty weird guy. There are all sorts of oddities in the way rooms relate to each other, most obviously in the dovetailing of the earlier and later versions of the outer curved wall, and while it’s always hazardous to reject an idea about Chaco because it seems to imply a weird way to do things (we have more than enough evidence that the Chacoans did plenty of things we consider weird), in this particular case I think the burden of proof definitely needs to be on those proposing that this complicated building is the result of a single idea. A look at some of the other great houses, particularly the later ones like Chetro Ketl that are much more regular and could well have been designed at one time, only confirms my impression that something else is going on at Bonito. The other conclusions in this chapter are less problematic, although they may still be controversial. The authors reject the idea of Pueblo Bonito as a massive apartment building comparable to modern pueblos such as Taos, and include with this rejection a critique of the concept of “pueblo” as applied to a building like this, and decide that it makes more sense to think of it as a “ceremonial center,” although they caution that that term has some problematic implications as well. They finish by analogizing Pueblo Bonito first to a machine, then to the beating heart of the “organism” that was Chaco Canyon as a whole. There’s a certain teleological flavor to these analogies that I find a little unpersuasive, especially in contrast to Windes’s careful documentation of complex and unpredictable change in form and function over time. James Farmer’s Chapter 5 is a bit of a change of pace. 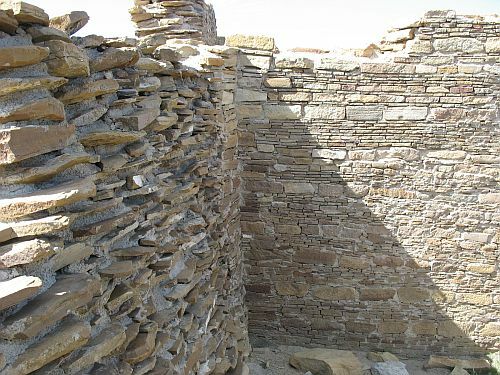 He discusses various aspects of astronomical alignments and their possible relationship to ritual, not just at Pueblo Bonito but in other parts of Chaco Canyon as well. As usual in these sorts of discussions, there is a lot of focus on Fajada Butte and the famous “Sun Dagger” petroglyph atop it, as well as some attention to Casa Rinconada, the great kiva that is quickly becoming another focal point for archaeoastronomical research in the canyon. Farmer approaches these as integrated parts of a single ritual system, and suggests specific ways that they could have been combined in elaborate scheduled rituals. His discussion is interesting, but a bit speculative, and I can’t help but feel that this sort of research has an unfortunate tendency to overemphasize the importance of the things we know about (e.g., the Sun Dagger) without adequately considering the question of how much there could be that we don’t yet know about. It also has a tendency to look at the overall layout of buildings and their relationships to each other synchronically without considering the complex construction histories of the buildings, although to his credit Farmer does take the changing orientation of Pueblo Bonito into account in his discussion. Still, I get the feeling from this sort of thing that people really should wait until more data is available before constructing elaborate theories. Archaeoastronomy at Chaco is in its infancy, and I’m quite sure there will be many changes in theories and interpretations in the future. I have a lot of issues with this. For one thing, the numbers Metcalf is using for just about everything are so simplified and generalized that it’s hard to take them seriously about anything. She uses constant values for the volumes of all walls and roofs that don’t have specific published measurements, and while she does make a distinction between the amount of labor required for flat and cribbed roofs, her adjustment to the calculations seems more than a little arbitrary. The result of all this is that while her final numbers are probably somewhere in the general area of the actual amount of effort, they’re so strongly affected by simplifying assumptions that it’s hard to tell which distinctions are meaningful. In addition, while the idea of separating “civic” from “noncivic” construction is interesting and possibly useful, it’s more than a little odd that Metcalf makes a straightforward identification of kivas with civic architecture, especially given how heavily she relies on Lekson, who has famously argued that kivas in this period were primarily residential and therefore not civic at all. It’s hard to say what to make of the ratios of civic to total construction effort on which she bases many of her conclusions, given this. Finally, even if these numbers can be considered rough estimates of total effort invested in construction, what does that really tell us? Metcalf rightly notes that person-hours is the only reasonable measurement to use, since, as she puts it, “the amount of time required for construction is affected by many indeterminate factors such as workday length, workforce size, and the efficiency of the builders,” making any conversion to different time units meaningless. In other words, person-hours can be interpreted either in terms of larger workforces working shorter hours or smaller workforces working longer hours, and in the absence of any additional information on workforce composition or the structuring of work time, there’s no way to tell where to set the balance. Which is all true enough, of course, but to me at least it seems to substantially reduce the usefulness of the whole exercise. If we don’t have outside information on either the amount of time spent or the amount of people working, this all seems like just playing with numbers. The numbers mean something, of course, at least assuming they’re reasonably accurate, but they don’t mean any of the things we actually want to know. This is no particular knock on Metcalf, who seems to have done a good enough job with the methods available. It’s just a general complaint about the amount of time devoted to this sort of thing in Chacoan studies in general. The next few chapters are, I think, some of the most interesting and useful in the book, and they more than make up for the weaknesses in some of the other chapters. Chapter 7, by Wendy Bustard, is an analysis of access patterns within Pueblo Bonito using space syntax analysis, a set of techniques for studying spatial patterns that I find particularly fascinating and of which I was totally unaware before reading this chapter. After a brief explanation of what space syntax is and what it can be used for, Bustard proceeds to demonstrate its usefulness by analyzing the access patterns of a variety of different parts of Pueblo Bonito built at different times in the building’s history. Her results show that the oldest part of the building has access patterns typical of residential use, as does one of the later wings, but the other roomblocks she analyzes have very different patterns, some much more accessible than typical residential spaces, some much less. The implications for the function of the building and possible changes in it over time are both quite clear and surprisingly ambiguous. Chapter 8, by Nancy Akins, is a short but very useful summary of information on the burials found in Pueblo Bonito. Most of the information here comes from Akins’s earlier work on the human remains found throughout the canyon, but it’s collected here in a more accessible place than much of that earlier research. The burials in Pueblo Bonito were pretty spectacular, especially in comparison to those found in the small sites across the canyon, and Akins’s conclusion that the differences indicate a social hierarchy of at least three levels, with the top two represented by the two burial clusters in Pueblo Bonito and membership in the higher social levels apparently ascribed rather than attained, fit well with the overal tone of this volume. The next two chapters, the last two before Neitzel’s concluding chapter, discuss the artifacts found in Pueblo Bonito from different perspectives. Neitzel’s Chapter 9 talks about the distribution of the artifacts, focusing on the differences between the distributions of “fancy” and “ordinary” artifacts. One of the most remarkable things about the distribution of the fancy artifacts in particular (turquoise, shell, jet, etc.) is that they are without exception massively concentrated in a mere handful of rooms. For most types of fancy artifacts one room contains so many more examples than any other that there is a huge gap in the numbers per room between it and the next-highest. Even more fascinating, these are almost all different rooms; that is, for each type of fancy artifact there is a single room with vast quantities of that particular artifact and lesser (but often still quite high) quantities of other artifacts. All of these rooms with huge numbers of fancy artifacts are in the northern part of Old Bonito, either in the burial block or the nearby group of rooms with the apparent ceremonial caches of which these artifacts are major elements. The distribution of ordinary artifacts is generally more dispersed, although some types, such as projectile points, show skewed distributions similar to those of the fancy artifacts, which suggests that the rather arbitrary division between “fancy” and “ordinary” may not have classified all artifacts satisfactorily. All of these patterns are illustrated with very useful and readable maps of the room distributions, one of the best features of the chapter. Chapter 10, by Frances Joan Mathien, takes a look at the same artifacts from a rather different perspective, focusing on the “fancy” artifacts, particularly those imported from great distances, and discussing the functions they may have had within the Chacoan system and the changing interpretations and models that have been offered over the past hundred years or so to explain them. She ultimately decides that the earliest interpretations, offered by George Pepper, the leader of the first controlled excavations in the 1890s, deserve a closer look than they have generally gotten. 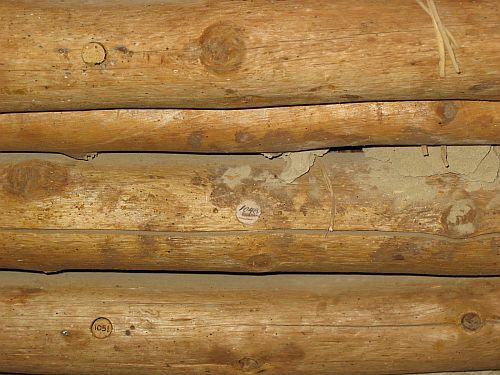 Pepper mostly interpreted what he found in terms of similarities to modern Pueblo practices, and he compared much of the apparently esoteric paraphernalia in the northern rooms to the objects used by modern clans in the ceremonies they conduct. Mathien finds this plausible even in light of more recent models of Chacoan organization, though she acknowledges that demonstrating this sort of thing is no easy task. Overall, this is a very interesting volume that provides a fairly complete picture of the state of current research on Pueblo Bonito. 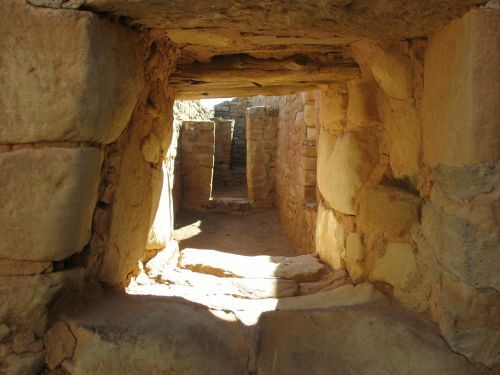 It is a little light on the relationship between Pueblo Bonito and the other canyon great houses to the overall Chaco system, whatever it was, but that is largely to be expected given its focus, and the structuring of the chapters around the three questions Neitzel presents in the introduction is a useful way of tying these otherwise quite different studies together. This is certainly not a book for those who are just starting to learn about Chaco, but it could be quite useful for those who have already read about or visited Pueblo Bonito and want to get an expanded account of current thought on it, with useful references to further, more detailed publications.